Full title: The Review 2014: a year in the life of Baltinglass, Bigstone, Grangecon and Stratford. Creator / Author: Compiled by the Communications Sub-Group of St. Joseph’s Parish Pastoral Council, Editorial Board: Mary Hanlon, Sr. Eileen Deegan, Renee Wall…et al. Publisher / Place of Publication: St. Joseph’s Parish Baltinglass / Baltinglass, Co. Wicklow. About: This is the eleventh issue of an annual publication. Within its A4-sized format, it chronicles activities in the parish during the year, publishes short articles of general or historical interest and includes photographs past and present. Contemporary advertisements help to provide a snapshot of local economic activity. Contents: A Word from the Parish Priest / Tommy Dillon – From the Editor / Mary Hanlon – Baltinglass Ladies GFC – Let’s Walk: Centra Baltinglass welcomes Rob Heffernan — Focus on Baltinglass Credit Union – Grangecon National School – A Harvest Festival to Remember – Gathering to Celebrate / Rosemary Shortall – Anything is Possible [poem] / Anon – Jennifer Retires after 41½ years Nursing Career – St Francis of Assisi Day, Stratford / Marie Halstead –What’s Goin’ on in Grangecon? / Kenneth Flood – Kids Aloud Celebrates 10 Years – Get Vocal Choral Group / Mary Hickson – Benemerenti Medal – Nancy Hughes, Kay Halstead, May Markham, Sr. Brigid – The Year 1990: a year never to be forgotten by all associated with Baltinglasss GAA club / Jim Sheerin – Kareem brings gold to Balto – My Daily Creed [Anon] – New History Board for Baltinglass / Paul Gorry – Global Brigades / Laura Horgan – A Baltinglass Lad who Fell in the Great War / Pat McGrath — Baptisms in Baltinglass Parish from 1st October 2013 to 30th September 2014 — Stratford / Grangecon G.A.A. – Niall Murphy — Weddings 1st October 2013 to 30th September 2014 [and Photo Gallery] – Remembering the Early Years – Going Home after 60 Years / Pauline Murray – 60 Happy Years of Priesthood / Fr. Des Byrne — [Photo Galleries] – Maisie and Patricia’s Naíonra, Chapel Hill [Photo Gallery] – Golden Wedding Anniversary – Baltinglass Men’s Shed is Formed — Tearmann Community Garden – A Baltinglass Institution Gets a Facelift / William Quinn – Patricia Doody Retires / Tom Hannafin – Active Retired in Baltinglass / Mary Vernon – Community Shop / Margaret Milliken – A Rose-tastic Life: the journey of the 2014 Wicklow Rose / Gillian Burke – Emergency Services / Mary Ryder – Lalor Centre/KARE / Pauline Balfe – Baltinglass GAA – Anne Lennon / Noeline Finnegan – Parish Life: a hopeful view for the future / Fintan Doyle – Rectory Repairs / Reverend Margaret Sykes – Marina’s Mirror Award – RÁS visits Baltinglass – Mountain Brothers [poem] / Kieran Alcock – Summer in the Alps [poem] / Kieran Alcock – Tour du Mont Blanc / Declan Alcock — College in the War Years – Part 4 / Frank Hunt – Baltinglass Hospital – Baltinglass & District Forum – Bigstone Tractor Run for Leukaemia – West Wicklow Choral Society – Art Competition – Bigstone N.S. – Greetings — Deaths in Baltinglass Parish 1st October 2013 to 30th September 2014 – Communions and Confirmations [Photo Gallery]. Extra #1: Contains eight full pages of photographs, not counting pictures included in individual articles. 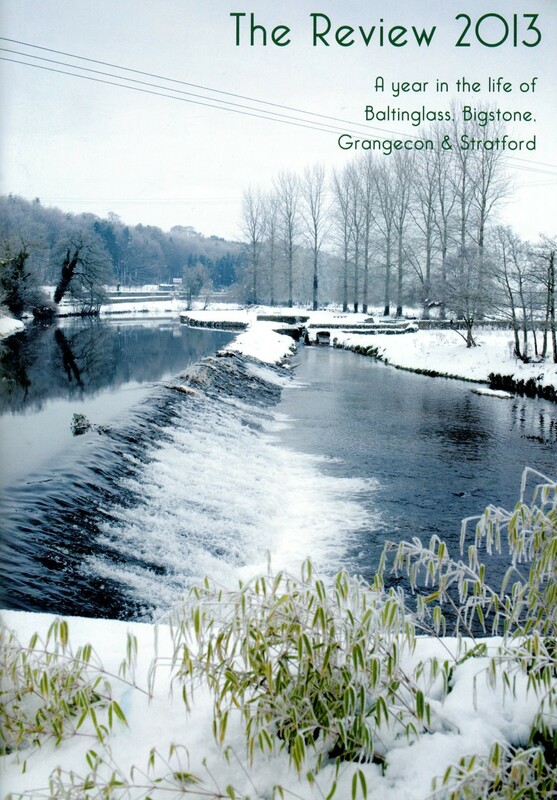 Full title: The Review 2013: a year in the life of Baltinglass, Bigstone, Grangecon and Stratford. About: This is the tenth issue of an annual publication. Within its A4-sized format, it chronicles activities in the parish during the year, publishes short articles of general or historical interest and includes photographs past and present. Contemporary advertisements help to provide a snapshot of local economic activity. Contents: A Word from the Parish Priest / Tommy Dillon – Foreword / Mary Hanlon – Episcopal Ordination of Very Rev. Denis Nulty / Sr. Brigid – Angel of Light / Marie Halstead – Baltinglass Amateur Dramatics / Pauline Hayes – No Name Club – Baltinglass Local Training Initiative / Sandra Carroll & Pauline Hayes – Marguerite Salmon – Cillian’s Trip to Lesotho, South Africa / Cillian Burke – Wedding Snaps [Photo Gallery] – Bingo in Baltinglass / Frank Hunt – Tommy O’Connor: an appreciation – My Lovely Wicklow [poem] / John Candy – Celebrating 100 years in Education – The Lalor Centre in the Year of the Gathering / Pauline Balfe – Con Cronin’s Retirement – The Rev. Canon Mervyn A. McCullagh [obituary] — Scoil Chonglais Debs Class 2013 [photograph] – Baltinglass: a town to be proud of / Martin Blake – Remembering the Main Street Cookes / Orla O’Sullivan – Our Parish Harvest Festival – Replacing the Negative African Stereotype with the Beauty of my World / Roisin Mangan — Baltinglass Adult Learning Centre – Kiltegan’s Next Top Model / Gillian Burke – Blueboy’s Retirement / Mick Kehoe – Ten-day Trek to Annapurna Sanctuary / Declan Alcock – A.I.B Club is Family Skills Day / Theresa Dowling – Cliona and Mary’s Trip to Lourdes / Cliona Kavanagh & Mary Gohery – Guess Who? Where are they now? [Photo Gallery] – Slaney Brown [poem] / Kieran Alcock — Baltinglass Ladies G.A.A. 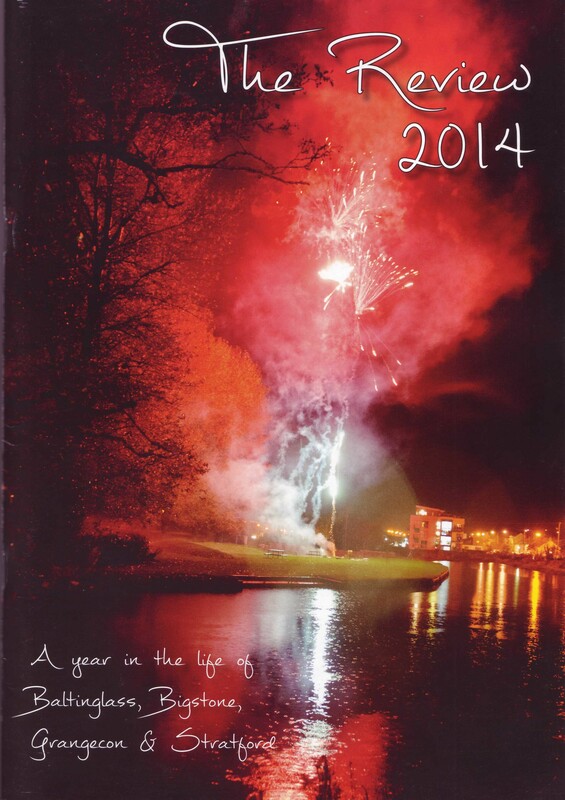 Highlights for 2013 – Baltinglass G.A.A. – Baltinglass Juvenile G.A.A. – Doyle Family Gathering – [Photo Gallery] – Karl Furlong — [Kiddies page] – The Balloon Festival 21st, 22nd and 23rd June 2013 / Noel Lyons – Baltinglass Area Community Games 2013 / Liz Tyrrell – Get Vocal Choral Group / Mary Hickson – A Musical Evening in September / Colette L. Gethings – Greetings — Deaths in Baltinglass Parish 1st October 2012 to 30th September 2013 – Baltinglass Hospital – Memories of 2013 / Mary Ryder — Scoil Naomh Iosaf – School Athletics 2013 — Baptisms from 1st October 2012 to 30th September 2013 — Weddings 1st October 2012 to 30th September 2013 — Punchestown / Seamie Donohue — Tearmann Community Garden – Dr. Mags Coyle [obituary] / Anne O’Connell – Mid-term in New York During the Hurricane / Patricia Lalor — College Life in the War Years Part 3 / Frank Hunt – Kildare & Leighlin Pilgrimage to Notre Dame / Mary Hayes — Stratford /Grangecon G.A.A. – Confirmations, Communions [photographs] . Extra #1: Contains five full pages of photographs, not counting pictures included in individual articles. About: A wide-ranging and beautifully produced hardback book which relates the history of Glenmalure and stories of its people. The content of this substantial book is meticulously and widely researched and includes oral testimonies. Every aspect is brought to life with lively text which is interspersed with glorious photographs and illustrations. 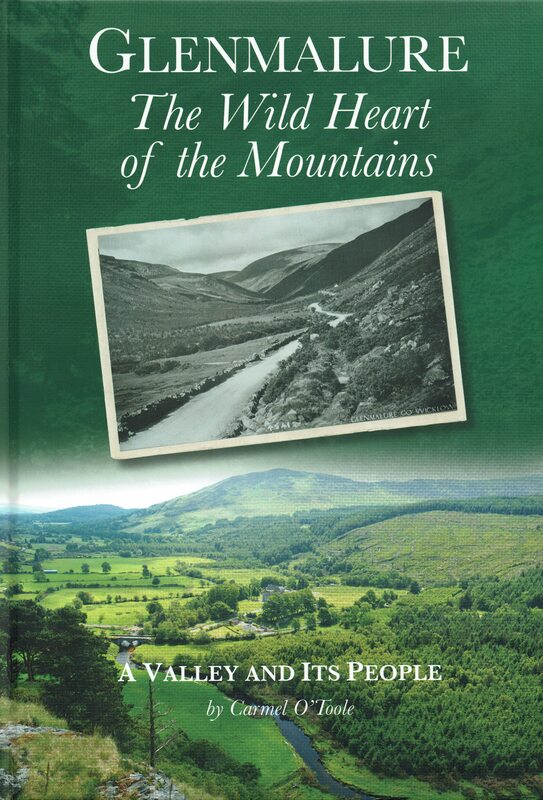 This book will stand as the definitive history of this lovely valley for years to come. Contents: Acknowledgements — Introduction – Glenmalure Timeline – Glenmalure Map – Early Inhabitants & Religious Settlements — Feagh Mac Hugh O’Byrne: Firebrand of the Wicklow Mountains — The Battle of Glenmalure — The Escape of the Ulster Princes (Red Hugh O’Donnell and Art O’Neill) — Feagh Mac Hugh O’Byrne 1580-1597 – The Twelve Graves – Glenmalure 1798-1803 — The Military Road — Glenmalure Lodge – Mining in Glenmanlure — The Last House in the Glen – The Shadow of the Glen: J.M. Synge and Glenmalure – Tragic Accidents in the Mountains near Glenmalure – Forestry Men and Timber Men — Sheep Farming in the Hills: old traditions and new methods — Glenmalure: reflections / Fr. Willie Walshe — Ballinacor Estate – Kirikee School 1881-1969 — GAA in Glenmalure — Glenmalure Today. Appendix II – Townlands, Placenames and Local Names of Glenmalure. Glenmalure – Conavalla and local place names in Conavalla — Ballinagoneen and local place names in Ballinagoneen – Cullentragh Park and local place names in Cullentragh Park — Ballinafunshoge and local place names in Ballinafunshoge – Ballyboy and local place names in Ballyboy – Ballybraid and local place names in Ballybraid — Carriglinneen and local place names in Carriglinneen — Kirikee and local place names in Kirikee — Ballinabarney and local place names in Ballinabarney – Ballintombay Lower and local place names in Ballintombay Lower – Camenabologue and local place names in Camenabologue — Barravore and local place names in Barravore – Ballinaskea / Bolenaskea and local place names in Ballinaskea / Bolenaskea — Clonkeen and local place names in Clonkeen — Corrasillagh and local place names in Corrasillagh — Carrawaystick and local place names in Carrawaystick — Clohernagh and local place names in Clohernagh — Drumgoff and local place names in Drumgoff — Fananierin and local place names in Fananierin — Ballinacor and local place names in Ballinacor – Banks on the road. Appendix III – Poems & Songs of Glenmalure. Glenmalure / Anon. – Glenmalure / Jim Byrne – Feagh McHugh / Thomas D’Arcy McGee – Follow Me Up To Carlow / P.J. McCall – The Battle of Glenmalure / M.J. McCann — The Battle of Glenmalure / Anon. – The Death of Feagh McHugh O’Byrne / MacKeohoe – Gleann Maoliúra / Biddy Jenkinson – At the Mass Rock / Jim Byrne – The Outlaw’s Bridal / Anon. – Michael Dwyer / T.D. Sullivan – Michael Dwyer / Peadar Kearney – The Rebel’s Grave / Jim Byrne – Glenmalure / Dave Curtis – The Lone Hiker / Peter Cunningham-Grattan – Daughters of Wild Glenmalure / Peter Cunningham-Grattan – Croaghanmoira / Jane Clarke – The Curate of Greenane / Peter Cunningham-Grattan – Jim Connolly / Peter Cunningham-Grattan – Old Ballinacor G.A.A. Song / Christy Hughes – Kathleen / Jane Clarke – Lovely Wicklow / W..J. Duffy – Glenmalure / Jim Byrne. Appendix IV – Leaders in Glenmalure. Michael Dwyer (1772-1825) – John Mernagh (1770-1857) – Patrick Grant (1761-1800) – Hugh Vesty Byrne (1770-1842) – Extract from the Memoirs of Miles Byrne. Extra #1: Includes numerous photographs, maps and other illustrations. Extra #4: View the entry for ‘Glenmalure’ in the Placenames Database of Ireland. 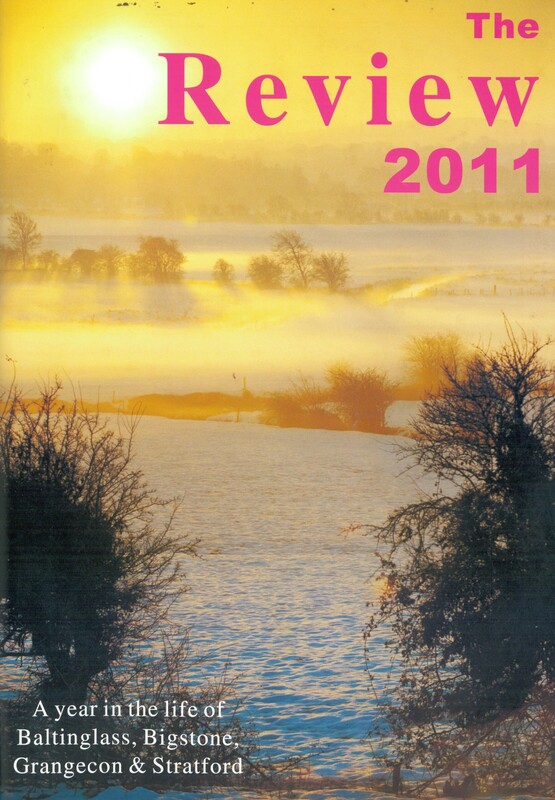 Full title: The Review 2011: a year in the life of Baltinglass, Bigstone, Grangecon and Stratford. Creator / Author: Compiled by the Communications Sub-Group of St. Joseph’s Parish Pastoral Council, Editorial Board: Paula Burke, Margaret Brennan, Bernie Doogue…et al. About: This is the eighth issue of an annual publication. Within its A4-sized format, it chronicles activities in the parish during the year, publishes short articles of general or historical interest and includes photographs past and present. Contemporary advertisements help to provide a snapshot of local economic activity. Contents: A Word from the Parish Priest / Tommy Dillon – Foreword / Mary Hanlon – Long lost medal makes a welcome return – Day Care Centre for Baltinglass — Holy Communion 2011 / Confirmation Classes 2011 [photographs] – Sean Corrigan sheep dog trialing success – Scoil Chonglais Debs 2011 [photograph] — Do not keep Christ to yourselves! / Sr. Clare Leigh, SSVM – Cian Lee – Dancing at Bigstone – 50th Wedding anniversaries – Get vocal — Stratford Grangecon GAA Club – 2011 the year that was – Eucharistic Congress 2012 – Pilgrimage to Lourdes / Nancy Hughes – The good life / Luci Grimes – College life during the war years / Frank Hunt – Weddings [Photo Gallery] – Celebrating 70 years on Main Street Baltinglass / Patterson Family – The Baltinglass No Name Club – what a year!!!! / Bronagh Murphy – Kilimanjaro / Seán Gethings and Pat Fleming – Stratford Lodge NS official opening / Phoebe & Sarah – The Baltinglass Parish community / Mary Ryder — Deaths in the Parish from 1st October 2010 to 20th September 2011 – Bigstone Karate to world championships / Josephine Lawler – Baltinglass & district active retirement group / Mary Vernon – The Curragh, County Kildare / Robert Doyle – The day I met Tom Crean / Tom O’Sullivan — Baltinglass G.A.A. Club summary of our activity during 2011 – Marie showcases her skills – Don’t you know? [poem] — Weddings in St. Joseph’s Parish from 1st October 2010 to 30th September 2011 – The messages (memories of the past) – Gaisce Award — [Photo Gallery] — Baptisms in St. Joseph’s Parish from 3rd October 2010 to 10th September 2011 – Knitting club in Baltinglass Hospital – Bigstone Community Alert – Kiddies page — Baltinglass Adult Learning Centre – The road to Croker / Anne-Marie Doran – Lalor Centre ‘Sleep Out’ / Peter Kelly — Tearmann Community Garden and wildlife area – “A good day out” / Declan Murray – Tuckmill / Orla O’Sullivan – September 11th – 10 years on / Joseph Kavanagh – School stars / Conor Foley – Stephen Walsh does Baltinglass proud / John Glynn – Childhood memories from 1930’s Tinoran – 30 years in front of a class / Eilis McDonald – Credit Union poster competition – Latitude [poem] / Cliona O’Connell – Stratford on Slaney Wicklow’s tidiest village / Tom Whittle – Scoil Naomh Iósaf report — Baltinglass Ladies GFC have ‘What it takes’… a review of the year. Extra #1: Contains four full pages of photographs, not counting pictures included in individual articles. 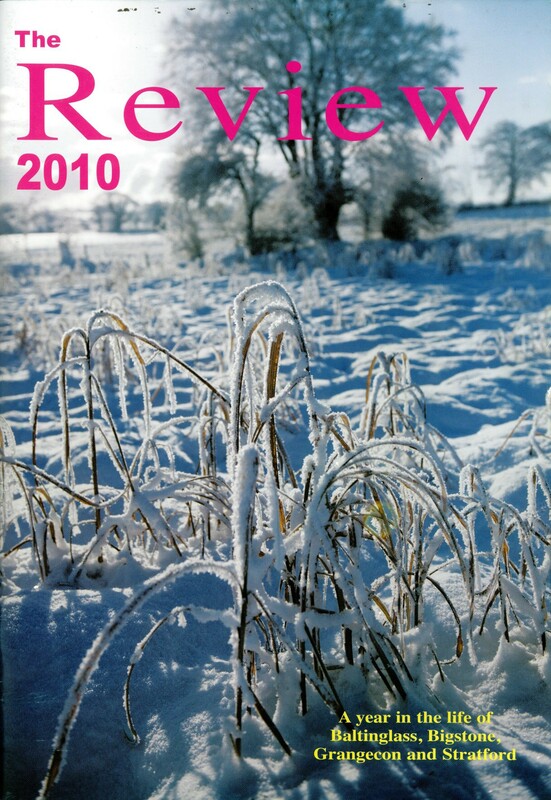 Full title: The Review 2010: a year in the life of Baltinglass, Bigstone, Grangecon and Stratford. About: This is the seventh issue of an annual publication. Within its A4-sized format, it chronicles activities in the parish during the year, publishes short articles of general or historical interest and includes photographs past and present. Contemporary advertisements help to provide a snapshot of local economic activity. Extra #1: Contains seven full pages of photographs, not counting pictures included in individual articles. Publisher / Place of Publication: [The Author] / [Rathangan, Co. Kildare]. About: A collection of short poems, the subject matter of which is rooted in the rural Ireland of the 1960’s but which still resonates in the issues confronting modern Irish society. Proceeds from the sale of this book go to The Friends of St. Brigid’s Hospice and Homecare Services, The Curragh, Co. Kildare. The specialist palliative care service for Kildare and West Wicklow is based in St Brigid’s Hospice. Contents: Introduction — Biography — [The Poems] — Crashing Out — Autumn — Hands of Clay — Ploughshares — Sixth Class (1972) — Spitting Tealeaves — The High Nelly — The Six O’Clock Bell — Blasket Island — Dammed If I Do, Dammed If I Don’t — Fly Fishing — Melt Down — Rolling Stones — Spring Garden — The Chicken Catcher — Tuning In — No Answer — Notions — Sixpence — Spiderman — Summer Rain — The Buttermilk Plant — Doggerel — Fish Fingers — Just Pickin — Mary Moran — Sea Legs — Seamus Heaney — Croagh Patrick — An Act of Contrition — Count Me Out — Padre Pio! Can I Ask You This. Did You Ever……..Smoke — Shelf Life — Unsaid. WW Connection #1: The author is originally from Tinahely in south west Wicklow and now lives in Rathangan, Co. Kildare. He has acted as facilitator for several Creative Writing projects in the Kildare area. 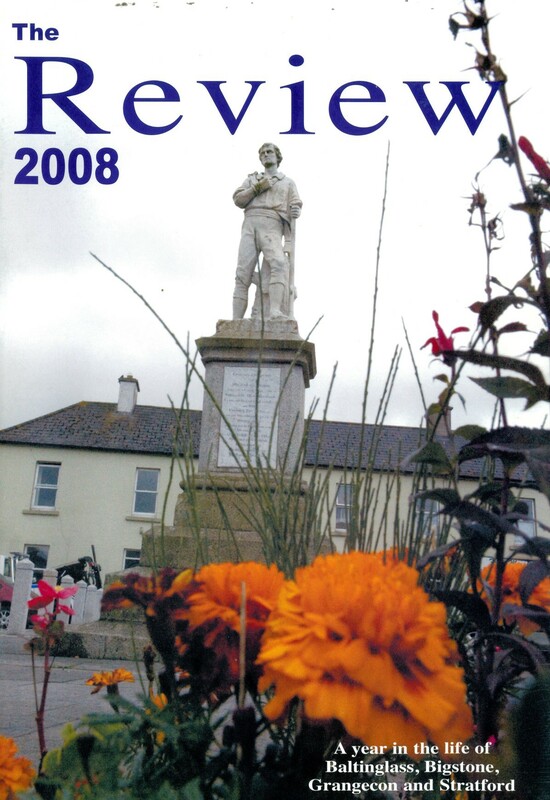 Full title: The Review 2009: a year in the life of Baltinglass, Bigstone, Grangecon and Stratford. About: This is the sixth issue of an annual publication. Within its A4-sized format, it chronicles activities in the parish during the year, publishes short articles of general or historical interest and includes photographs past and present. Contemporary advertisements help to provide a snapshot of local economic activity. Contents: A Word from the Parish Priest / Tommy Dillon – Foreword / Mary Hanlon – Lourdes Pilgrimage – Baltinglass Adult Learning Centre – A Tribute to Baltinglass [poem] / Tommy Doyle – Active Retirement / Michael Cogan — Baltinglass Youth Club – Baltinglass G.A.A. Club summary of activities for 2009 – A hidden gem / Orla O’Sullivan, The Pike – Hello from Tanzania / Monica Gorman – 40th Wedding Anniversary / Mary and Ken Hannon – Grange Con interpretative panel / Sheila O’Toole – The Underdogs / Julie Fitzmaurice – A native of Baltinglass / Mai Quaid – War time experiences in London / Cora Lawlor – 50 years later for George & Olive Manley – Malawi 2009 / James Sheerin – Report on the 6th World Karate Championships (Novo Mesto) Slovenia – An unforgettable day / K. Halstead – GAA memories / Johnny Kenny – The big snow / Mary Ryder – The Patrick’s Day parade / Fran Quaid – Stratford GAA Club — Baptisms in St. Joseph’s Parish from 1st October 2008 to 30th September 2009 – The story of the car that bought the football field – The summer 1936 / Eugene Dunne — Tearmann Community Garden – The Lalor Centre – Grange Con Boxing Club / Declan O’Kane – The Green Lane – Golden Jubilee Tom & Nuala Kavanagh – Memories of a teacher / June Snell – Bringing people together / Yvonne Kerr – Front page of ‘Farm Home’ 8th August 1959 – 1959-2009 St. Pius X BNS / Scoil Naomh Iosaf, Baltinglass 50th commemorative celebration – 50th wedding anniversary / Seamus Hunt – Greetings — Weddings in St. Joseph’s Parish 2009 [Photographs] — Weddings in St. Joseph’s Parish from 1st October 2008 to 30th September 2009 – Scouts – Wado Ryu Karate — Baltinglass Parish Folk Group — Deaths in the Parish from 1st October 2008 to 30th September 2009 — Scoil Naomh Iosaf’s 6th Class jigsaw challenge – Photo Gallery — Baltinglass & District Country Market – Area Community Games win gold and bronze at National / Liz Tyrrell – The tower in the graveyard / Paul Gorry – Bernard Jackman – Climbing the Reek – A sacred place / Anne Lee – St. Paul’s Oratory, Parish Centre, Baltinglass / Mary Cronin – Photo Gallery — Holy Communion / Confirmation Classes 2009 [photographs] – The Deanery youth ministry – Tommy Doyle: President of Carlow Rugby Club 2009-10 – Children’s Section – Reflection of Zambia experience / Emma Byrne – Baltinglass Bowls – Carriage Racing – West Wicklow Arts Network summary 2009! – Positive ageing in Baltinglass Hospital – Eilish McDonald in Malawi / Eilish McDonald. 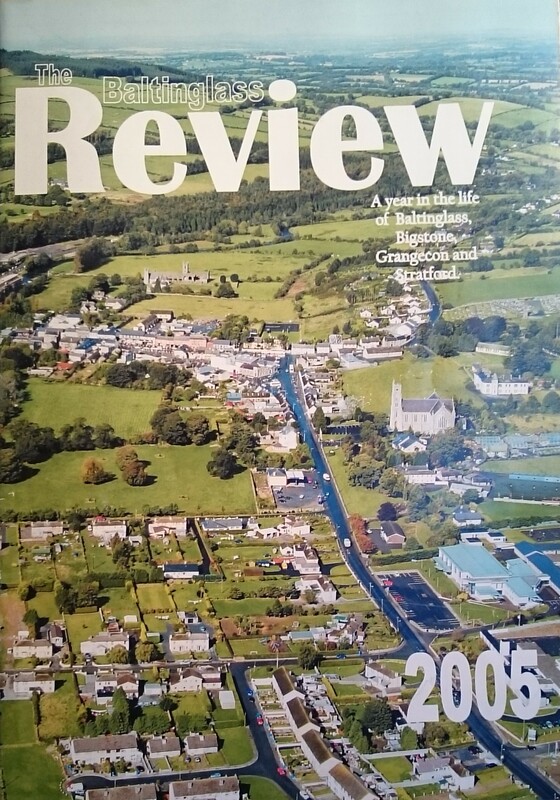 Full title: The Review 2008: a year in the life of Baltinglass, Bigstone, Grangecon and Stratford. About: This is the fifth issue of an annual publication. Within its A4-sized format, it chronicles activities in the parish during the year, publishes short articles of general or historical interest and includes photographs past and present. Contemporary advertisements help to provide a snapshot of local economic activity. Contents: A Word from the Parish Priest / Tommy Dillon – Foreword / Mary Hanlon – Thanks to One and All / Fr. Pádraig Shelley – Baltinglass Youth Club – ‘Young at Heart’ in Baltinglass Hospital – Baltinglass Golf Club wins Brennan Cup – Baltinglass Ladies G.A.A. Club 2008 – Rugby in Baltinglass Over the Years / Tommy Doyle – Rugby in Scoil Chonglais / Ciaran Keegan – Murray’s Shop – Report on Allen Cup Winning Team Dec. 2007 – A Visit From Uganda / Fr. John Tumuhairwe – The Curtis Cup / Mai Quaid — Grangecon Boxing Club – From the New Priest / Fr. Sean Maher — St. Joseph’s Parish – Present and Future — Report on U14 Football Final 27/9/08 in Arklow – Baltinglass Win School Title – National Community Games Finals 2008 – Organic Gardening / Jim O’Toole — Scoil Chonglais Review of the Year – Parish Pilgrimage to Rome / Ina O’Keeffe — Tearmann Community Garden Baltinglass — Baltinglass & District Active Retirement Association – Autumn Memories / Sister Josepha O’Donnell — Baptisms in St. Joseph’s Parish from 1st October 2007 to 30th September 2008 — Baltinglass & District Country Markets Ltd. – Photo Gallery – Grangecon National School 1947 [photograph] – Baltinglass Gets Fairtrade Status — Baltinglass Golf Club 1928-2008 / Mai Quaid – Baltinglass Parish Folk Group – 30th Anniversary of the Church of St. Oliver Plunkett / Grange Con Liturgy Group – Baltinglass / Rathvilly Macra na Feirme Reunion / P.J. Hanlon & John Kehoe & David Leigh — Weddings in St. Joseph’s Parish from 1st October 2007 to 30th September 2008 – Elizabeth Nolan – Mary Cronin (nee Doheny), Teacher Bigstone National School: an appreciation — Weddings in St. Joseph’s Parish 2008 [Photographs] – There & Back Again / Mary Powell – Kilranelagh Graveyard / F.P. Hunt – Full Speed Ahead – Richard Crosbie – The Einstein Puzzle — Stratford/Grangecon GAA – Deaths in the Parish from 1st October 2007 to 30th September 2008 – Article from the Past: Stratford-on-Slaney Tidy Towns Success 1979 – Stratford-on-Slaney / Tony Graham – Old Adds[sic] 1937-1948 – World Youth Day / Fr. Pat Hughes — Baltinglass Community Park / Lisa J. MacGabhann & Roisin Byrne – Past and Present [poem] / Kathleen Fleming – The Old Football Field (Paul Kehoe’s Field) / F.P. Hunt – A Christmas Memory / Mary Ryder – Baltinglass GAA Club — Holy Communion / Confirmation Classes 2008 [photographs] – Childrens Section – Michael Dowling / Michael Dowling. Full title: The Baltinglass Review: a year in the life of Baltinglass, Bigstone, Grangecon and Stratford. About: This is the second issue of an annual publication. Within its A4-sized format, it chronicles activities in the parish during the year, publishes short articles of general or historical interest and includes photographs past and present. Contemporary advertisements help to provide a snapshot of local economic activity. 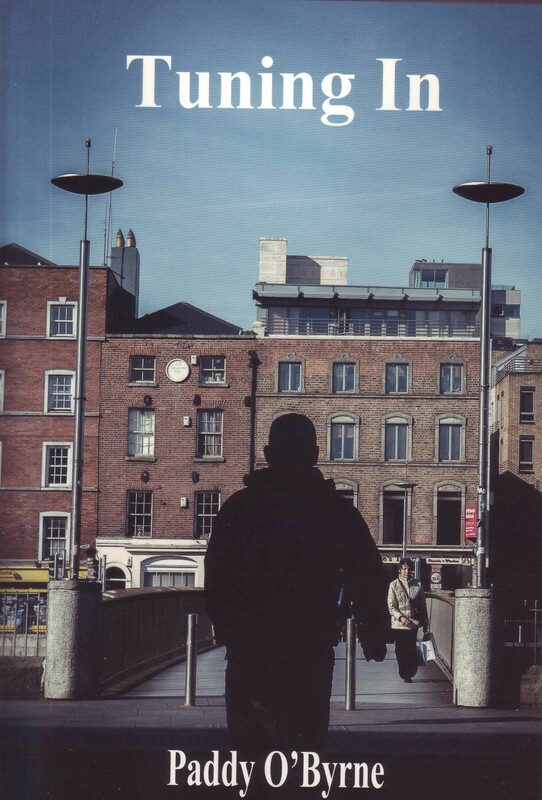 Contents: A Word from the Parish Priest / Tommy Dillon – Foreword / Assumpta O’Neill – My First Experience of Confirmation as a Parent / Carmel Doyle – Confirmation / Faith Doyle – 28 Years Later / Fr. Thomas Dooley P.P. – St. Josephs Juvenile F.C. 2004/2005 / Mary Cullen — Picture Gallery  – World Youth Conference– Cologne August 2005 / Anna Whittle – Visit of the International Pilgrim Statue of Our Lady of Fatima / K. Halstead – Remembering Ballybrit Racecourse, Galway, September 30th 1979 / Matt O’Brien and Michael Farrell – Féile Peil nÓg / Martin Coleman – Life in Education / David Hallahan – “I’m Late, I’m Late, for a Very Important Date / John and Sheila O’Toole – Society of St. Vincent de Paul – Baltinglass Justice Group – Fr. Pádraig Shelly – Cultural Event: Art Exhibition / Myra Kearney – Childhood Christmas Memories from Tinoran – ‘You’re a Star’ Comes to Baltinglass Hospital / Carmel Gannon – Lalor Centre Bids a Fond Farewell to Mary – Brigid [a poem] / Mary Hayes – Ordination of Rev. Pat Hughes / Fr. Pat Hughes — Picture Gallery  – Behind the Scenes at Badys / Ravna Lange – Skenderbeg, Baltinglass and the Ties That Bind Us / Paul Gorry – Walking All the Way / Adrienne Finlay – Jolly Tots Parents and Toddlers and Baltinglass Women’s Group / Jane Negrych – Baltinglass & District Active Retirement Association / Mary Vernon – A Busy Day for our Parish Choirs: Fr. Pat Hughes Ordination / Mary Hayes – The Baltinglass Adult Learning Centre / Annette Mangan – The Old Exchange – Stratford on Slaney Post Office – A Musician’s Life / Fiona Joyce – Pitch and Putt / Martin Donegan – Knockpatrick Cemetery / Bill Dunne – Baltinglass Credit Union – Gardening Snippets / Jim O’Toole – Kids Aloud – Bigstone Karate Kids Win Medals in International Event / Kieran Burke – Fiche Blian ag Fás – Trek in Patagonia to Help Fighting Blindness Charity – Sliabh na mBan / Mary Ryder – Baltinglass Park: Your Park – Picture Gallery  – Kid’s Quiz. 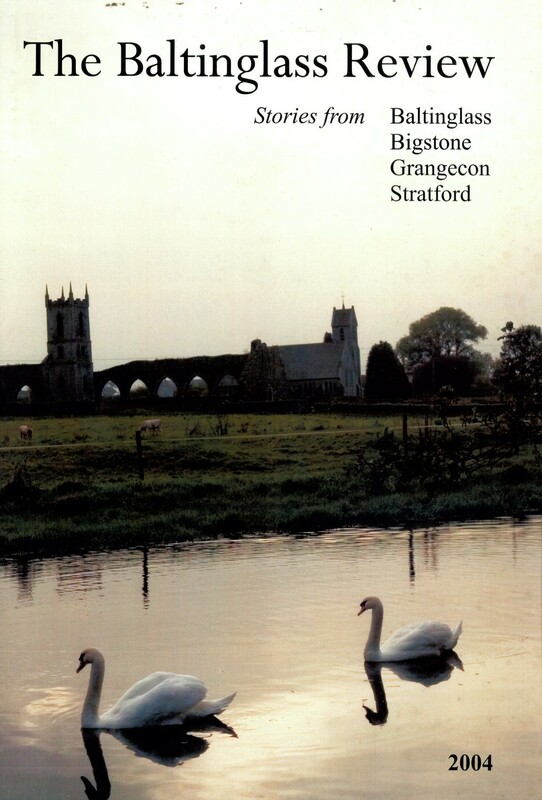 Full title: The Baltinglass Review: stories from Baltinglass, Bigstone, Grangecon, Stratford. About: This is the very first issue of what has become an annual publication. Within its A4-sized format, it chronicles activities in the parish during the previous year, publishes short articles of general or historical interest and includes photographs past and present. Contemporary advertisements help to provide a snapshot of local economic activity. Contents: A Word from the Parish Priest / Tommy Dillon – Chairperson of the Communications Group / Assumpta O’Neill – Lourdes / Sr. Brigid – Our Journey to the National Finals of the Credit Union Schools Quiz 2004 – An Adventure in Guatemala / Marina Doyle – Baltinglass Town Soccer Club – Baltinglass Foróige Club – A Word of Greeting from the President of Macra na Feirme / Thomas Honner — Baltinglass Lions Club / Eddie Hillan – Caring for Baltinglass Cross / Pat Fleming – Photo Gallery  – Seeing Self-Help on the Ground in Africa / Monica Gorman – Rathbran Cemetery: an Historical Place of Interest / Kay Halstead – A World Champion for Baltinglass and Bigstone / Kieran Burke – By Candlelight [poem] / Mary Ryder – First Holy Communion 2004: a mother’s perspective / Nellie Barrett – A Child’s Perspective / Jennifer Barrett – The Activities of Baltinglass Hospital / Josie Dooley – Building a Rainbow / Janet Gorman – Active Retirement Association / Margaret O’Donnell – Liam Lawton in Concert / Mary Hendrick – Baltinglass Golf Club / Danny Losty – Climbing Ben Nevis: and coming back down again / Monica Gorman – Indoor Bowls: Balto’s Best Performing Team of ’04 / Edward Lawrence – Sam McAllister: our oldest resident / Paul Gorry – Baltinglass Town Park / Lisa MacGabhann – Baltinglass Adult Learning Centre / Annette Mangan – Proposed Parish Centre: a plan for tomorrow / Jim Kearney – The Show Must Go On / Pauline Hayes – A New Home in Baltinglass / Michael Staunton – Looking Back / Frank Hunt – Memory Lane [photographs] – Making History for Parents – Grangecon Boxing Club: fighting for forty years / Declan O’Kane – Liam Completes Route 66 / Liam Hanlon – The Wind of Change / Jim Fanning – Local Whizz Kid Flies Balto Flag / Jimmy Burke – Retirement / Joey Fagan – Photo Gallery  – Baltinglass G.A.A. Club / Martin Coleman – Photo Gallery  – Puzzles – Golden Jubilee of Fr. Des – Baltinglass Cultural Weekend / Vinny Gethings. Extra #1: Contains at least seven pages of photographs, not counting pictures included in individual articles.